When war broke out in Syria, Muna—an Iraqi refugee—was forced to flee to Lebanon with her family. Her grocery list transformed overnight—from the fresh foods she loved to buy in local markets to what she and her family had no choice but to eat to survive. This is the story about how Muna’s family found their way back—thanks to ZeroHunger Heroes like you who are helping the World Food Programme (WFP) save and change lives. The image most associated with food aid is one of distribution points, long lines and bags of rice. But as the world evolves, so too does the assistance provided by WFP. The world’s leading humanitarian agency fighting hunger is striving to make food assistance a dignified and human experience. In developed markets bags of rices have transformed into simple electronic cards, allowing refugees far from home to define their own food preferences at local shops. Take Lebanon, where WFP operates entirely on cash assistance. The humanitarian agency has established a retail team to support its 500 contracted shops in providing quality products, fair prices and kind customer service. With the support of WFP’s Innovation Accelerator and staff in the Lebanon Country Office, the Dalili — or ‘my guide’ in Arabic — smartphone app was created as part of this commercial approach to humanitarian assistance. Dalili provides information on nearby shops, food prices and promotions at stores where refugees like Muna can redeem their assistance. While the platform is simple, its effect is multifaceted: It has a positive impact on refugees, encourages competition among retailers and strengthens the local economy. And now, its benefits are available nationwide. In the quiet village of Qabb Elias in eastern Lebanon, Muna sits on her porch swiping through Dalili, alongside her three-year-old daughter Lamar. Just a day away from when WFP “tops up” her monthly WFP cash assistance, Muna prepares a grocery list — a ritual familiar to her life back in Syria. Bargain hunting from the comfort of her home, she gets excited scrolling through the app. “One time, I found 4,000 Lebanese pounds (US$ 2.66) savings on milk,” she shares, enough to buy bags of pasta to make four dinners for her family. Al Radwan, the large local supermarket where Muna found the deal, quickly became her preferred shop. Al Radwan stocks both international brands as well as Syrian brands, providing a taste of home. When asked about special promotions at Al Radwan, Lamar — meaning ‘bright’ in Arabic — leaps from her mother’s lap, eyes brightening, and exclaims, “na’am” — yes!” Giggling, Muna explains both her son and daughter look forward to the promotions of their favorite foods. She begins to double check her grocery list on Dalili to confirm which stores have the best prices for each item. Muna’s neighbours join her in the activity, gathering on her porch on the hot afternoon. Many of her friends also shop at Al Radwan, while others prefer smaller family shops contracted by WFP. Omar has benefited from WFP support in improving the layout and assortment of his shop. 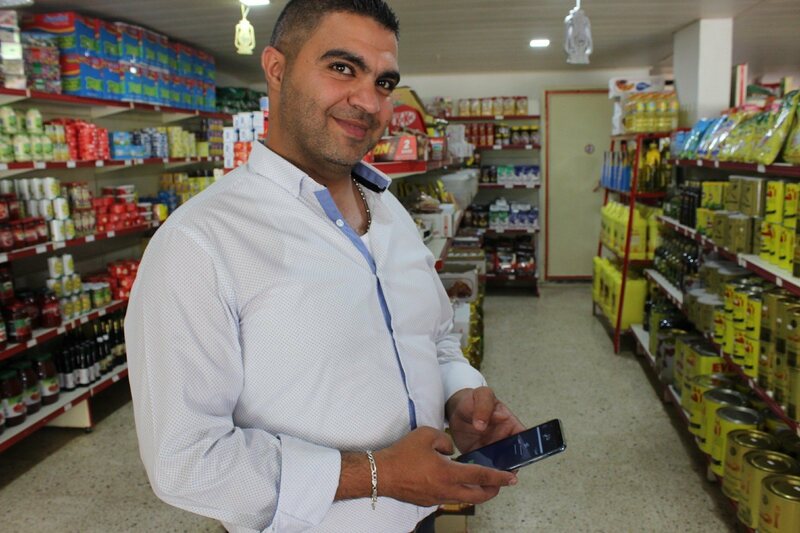 To compete with neighboring shops like Al Radwan, Omar, the owner of Al-Hayek supermarket, drastically improved his store with the support of WFP, which provides retail trainings and one-to-one shop consultations on issues ranging from layout to product assortment. Now the shop is rearranged, aisles are categorized and he has added more items, including Syrian brands. He uses Dalili as free advertising for monthly promotions. As a result, there are always new faces showing up in the shop, along with his regular customers. For Muna, who has lived over half her life as a refugee in two countries, feeling accepted by her community is essential. Customer service means more than a pleasant shopping experience; it is a matter of feeling welcome or not. For refugees who have traditionally received food in distribution lines, grocery shopping is more than a routine task. It is the freedom to purchase food and cook meals that tie cultural identities. Families across Lebanon use WFP assistance to make traditional Syrian dishes, teaching children the flavors of their country. Just as Dalili connects refugees with retailers, it is the food they purchase and bring home with them that ultimately brings people together. We at WFP USA are in it for the long haul. With you by our side, we’ll make sure food helps every human being like Muna reach their potential. Thank you for being a ZeroHunger Hero!